While the Mars rovers are assiduously searching the red planet for water over the next decade, there are whole moons full of the stuff just waiting for us to come visit. At least, that’s the theory. But missions to Europa and Titan are still hypothetical, so in the meantime NASA is toying with ideas about how a robotic lander would get through the miles of ice that lie on top of these extraterrestrial oceans. From their limited observations of Europa, scientists estimate that the ice is somewhere between 6 and 12 miles thick. We’ve never had to drill through anything like that using an autonomous system, let alone one that’s being bathed in radiation from Jupiter. That’s what the Ocean Worlds Mobility and Sensing project looked into. “Robotic systems would face cryogenic temperatures and rugged terrain and have to meet strict planetary protection requirements,” said JPL’s Hari Nayar, who oversees this particular robotics program, in a NASA news release. 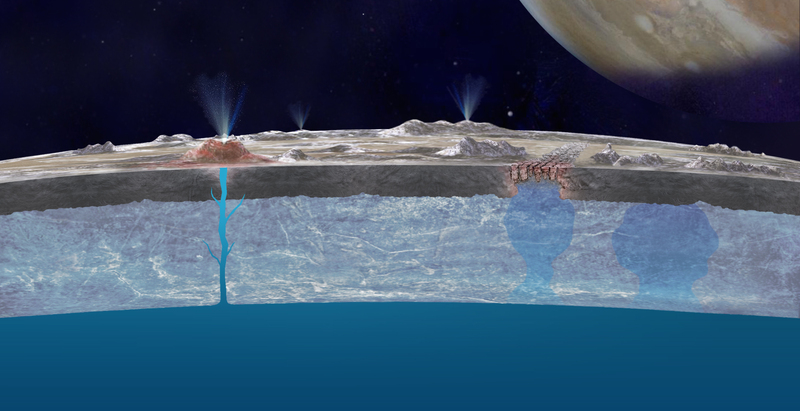 Artist’s concept of what the crust of Europa might look like, with features like ice volcanoes and other cool stuff. Among the systems undergoing testing right now are the two highlighted today: one for surface testing, and one for deep drilling. The surface testing system uses a claw with heated tips that would grip the ice and provide a platform for a drill. The drill could core out a sample, or the whole chunk of ice could break off and be returned to the lander for testing. And because it’s unlikely they’re going to land within spitting range of the sample the scientists like the look of, a robotic arm system is also being looked into, in order to get at locations dozens of feet away. They’re even considering a sort of projectile claw that could fire even further, but let’s not get too attached to that idea, because it’s pretty insane. For deeper drilling, the proposal is a sort of nuclear spinning saw blade, which sounds insane but actually isn’t. The saw would cut through the ice and throw detritus upwards, where it would be melted by a plutonium-powered heat source and sucked back up to the surface or elsewhere for analysis. Other deep ice drills use lasers or superheated water to make their way downwards. These are just prototypes right now; it’s hard to make anything purposeful when you don’t know where you’re going to land, what the makeup of the surface there is and so on. But hopefully we’ll learn enough from the upcoming Europa Clipper mission to get started.